Final Ghost from Path A in the Ghostly Robes Miniquest. First floor, just south of Aberrant Spectres. Took me a while to find him as the entry in the guide is from the old Slayer tower. Just wondering if it is possible for someone like me to be able to momentum QBD. I refuse to use abilities since I detest EoC, so momentum is the way forward for me. I'm working on getting full Tetsu... I don't have Drygores and quite frankly don't want to bother wasting money on them as I hardly ever combat anyways. What would be a good set up/inventory for me to use? The second part is Dom Tower... Is that easy to momentum? Also what's the best way to get journal pages etc and complete Dom Tower? 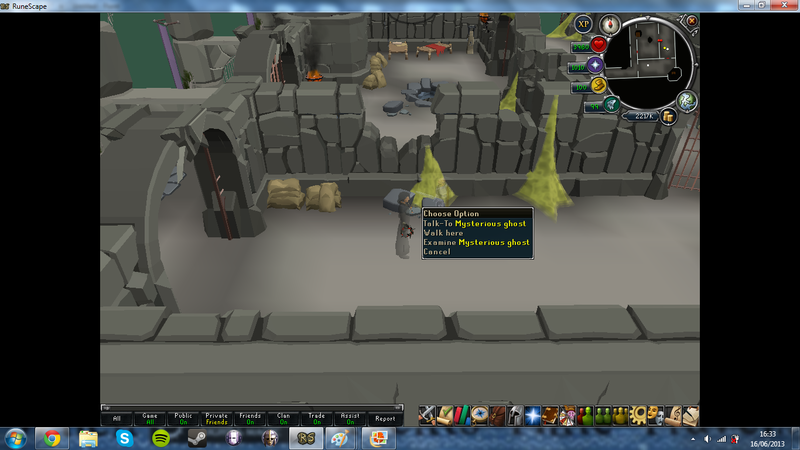 Since I need that for Desert Elite and Comp anyways. Also Sunfreet? First of all I feel like that Dog Meme... Y'know the one that is all "I have no idea what I'm doing". Anyways I'm fed up of my laptop, it's 4 years old this year, and whilst it still works decently it can be laggy as hell. Rune is a nightmare to play etc etc. So I'm planning to beg my parents to let me get a PC/Laptop as a deal for 2 years worth of Birthday presents (this year and next), probably throw a Christmas in there too, and it being a reward for my M.A. if I get a Merit/Distinction. Now... I know nothing. So Octarine has just helped me design something on a website he uses called CCL Online. Motherboard: Gigabyte (GA-78LMT-USB3 Motherboard Phenom II AMD Athlon II Socket AM3 AMD 760G Micro ATX RAID gigabit ethernet). I was just wondering if this is a good spec PC? Mostly I'd play Rune, but sometimes I would love to be able to play things like League of Legends or games from Steam like Civ5 or the Total Wars I have. 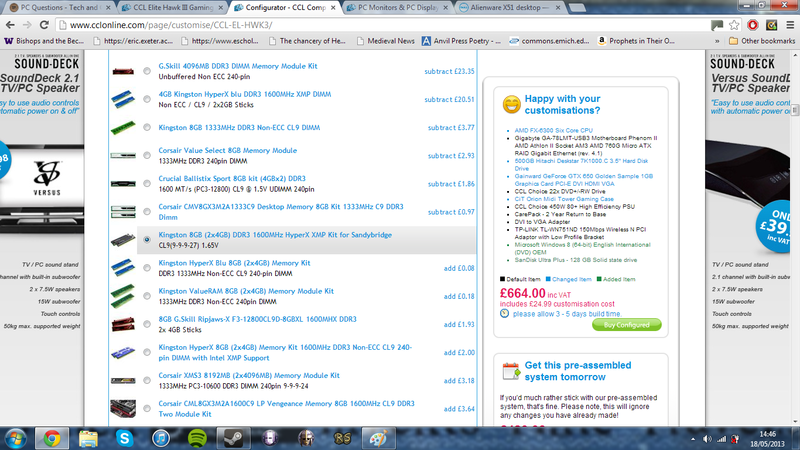 Maybe it's overkill the system that's built, but for £600 could you get anything better? I want something that has longevity, and also allows me to play games, and hell even multitask - IE play LoL/Rune with iTunes open and playing music, or play Medieval 2: Total War whilst in a Skype call to friends playing it too. Those of you with a Techy mind, which is the better value for money? 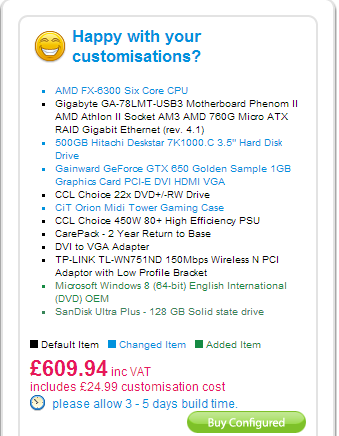 The PC Oct practically designed for me with Windows 8, SSD etc is £609.94 including the building fee... Or Draz's PC which costs £569 (I think or therebouts) and I get Windows 8 etc with it. Or if you guys can come up with something fantastic and epic and fast with a good shelf life for ~£600 or less I would love you all forever. Anyways this makes my brain hurt as I've no idea what I'm doing in reality. EDIT: Complainy mother when I raised the idea of getting a Desktop... Any idea on laptops with good processors I can get for that kind of price? Just wondering which Island is the best for Runespanning in peoples opinions for gaining optimal xp/hr there. Also what is the best world and is there a friends chat for it? So for all those like me who are history buffs, there is a possibility of Richard III having been found in the Greyfriars car park in Leicestershire. And as Professor Lin Foxhall says: "Archaeology almost never finds named individuals" so this is an extraordinarily amazing find! The skeleton they have found seems to fit in with what would be expected - ie. Caved in skull (Richard is said to have had his skull bashed in by chroniclers) and scoliosis which would have made one shoulder look slightly higher than the other. What're your thoughts on it. Also this could open up to an interesting discussion about the House of York vs the House of Lancaster.